Old Boy had been at the shelter for a very long time. He's 12 and senior dogs are extremely hard to adopt. People don't want them. But Old Boy deserves a life outside a cage to enjoy his last few years. This was taken last Friday - look at that happy boy go! He is loving life! To run and play .......... To be a dog. This one I tried a different approach than my usual reverse drawing with fusible and freezer paper. I did use freezer paper but traced each piece on the freezer paper then ironed that onto the right side of the fabrics. I left all the edges raw but did make sure the adjoining pieces all had enough overlap to the piece beside it to cover well. I then took a thin piece of fusible interfacing, laid it over my drawing for a map of where to place all my old boy puzzle pieces. After laying all of it out looking at the original photo and my "map" for guidance - all was then ironed to fuse in place using parchment paper as a pressing cloth. Then the excess interfacing was cut away before putting on a background. Since he was all one chunk at this point I was able audition lots of backgrounds. Once laid in place on the background he was glued in place by using a very thin line of Elmer's all the way around. And then each individual piece was also glued the same way. This prevents the fabric from getting caught in the hopping foot or flipped the wrong way while free motion quilting. 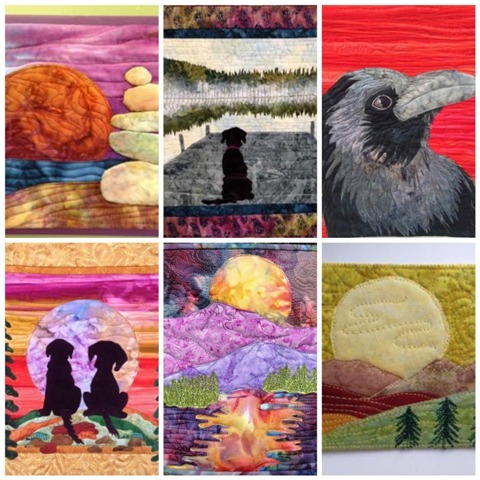 Susan Carlson uses this technique on her amazing quilts. Have you seen her crocodile quilt? Omg, amazing! You can read about how and why she uses glue here. Then he was quilted - a lot. I gave him to Old Boy's mom and neglected to take a photo of him completed but at least you can see the process. He was a joy to create and I may use this raw edge collage method again. Lots of glueing but you end up with less glue in your project than fusible and a lot easier than turned under applique. I want to wish all my online quilting friends a very Happy Christmas and Hanukkah. (Whales tails atop a hill in south Burlington) how cool is that! I realized that the phone pillows I talked about last week actually work just as well, if not better as an I pad pillow or a tablet stand - how cool is that! Since a lot of my Netflix and PBS watching is done on my I pad this is perfect for me. I am making a few for gifts for some co workers as well. See my post from last week for a tutorial on how to make them and a link to the original tutorial that I am using. It's a quick project. Like a lot of the country we here in Vermont are getting a cold snap. When I got up this morning it was -1. Now it's 10:30 and it's -2. I'm not whining mind you, I have the day off, gas fireplace blazing warmth into the room, lots of sewing to do and a good excuse not to go out - bring it on old man winter! I found a few tutorials on making these very useful phone rests online and like the one on factotum of arts blog here. This one is quick and easy. All you need is one piece of fabric 9" X 12" - some rice or small beans to stuff inside for weight and a bit of fiberfil. Also a small, only 1" X 5" piece of heavy interfacing. Cut your fabric 9" by 12" and then fold in half on the long side so it is 6" by 9"
Sew along two of the raw edges with a 1/4" seam leaving a 2" opening about an inch from the folded edge. Turn it around so the long seam is in the middle as shown. The top will easily make a triangle. Press seam open. On the bottom raw edge sew leaving another 2" opening about 1" from the edge. Turn inside out thru one of the 2" openings. Measure 3" up from the bottom, Mark a line and sew on that line. Cut a piece of heavy peltex or other extra heavy interfacing 1" by the width of your pillow. Insert the interfacing thru the bottom hole and fit it snug against the line you just sewed. Sew along the bottom edge of the interfacing to secure. Fill the bottom tightly with fiberfill and hand sew the opening shut. Thru the other hole pour in rice or small dried beans - fill about 2/3 with them. I made a funnel out of some light weight cardboard to make it easier. Fill the rest with the fiberfill, making sure the rice is on the bottom. Fill tightly until it sits up the way you want it. Then hand sew the opening shut. Make a bunch of them to put in every room so you won't loose your phone. Set it by your sewing machine to watch a video or chat with a friend. They make great gifts as well. This time of year I always get the urge to make little gift type items. I have a small family who won't be around on Christmas and no spouse at the moment so there is no reason to make gifts but I do it anyway. Last week I made these little credit card wallets. I made one for myself a long time ago and use it a lot. There are lots of tutorials on how to make these. I used this one only used Velcro and made it a tad smaller to make the cards fit snug so they won't fall out. I walk and hike a lot and like to bring my license and a credit card but don't want to carry a purse or wallet and these little wallets are perfect to keep in your pocket. This is the perfect solution. Two little pockets just big enough for a few cards. Velcro keeps it closed and safe. For a filler I experimented using batting then felt but found this thin 1/8" foam works the best. And I get to play with my novelty fabrics! Ended up making quite a few so put them in my etsy shop here. I thought they would make a great gift card holder as well as the gift of being a credit card wallet. I'm kind of over making them now and am on to smart phone pillows. If you use glue for basting you will love this simple tool. It gives you a nice thin line of glue and comes out nice and smooth. I used it for an applique project and it worked like a charm. I was able to easily get under all the edges with no problems and it went pretty quickly. You can buy them online at Purple Daisies here. They are a package of 2 for 10 bucks - well worth it. I hope you all had a nice thanksgiving and that you can spend some time relaxing and sewing on Black Friday. If you are on Twitter or Instagram search for #bfsi or #blackfridaysewin to see what others are doing. Read last weeks post for an explanation of the OM symbol. The one from last week hangs in my home. The quilting doesn't show up as good as the previous because there is more of a print. I think in the future if I want to showcase quilting a solid or tonal works the best. I showed you my cartoon like Zu Zu (my dog) a couple weeks ago - photo on top. Since then I darkened under the ears and wanted to show you what a difference that one thing made. I can't believe it's almost thanksgiving already! We have had a very good November here in Vermont. It's usually dark rainy and gloomy most every November day but this year we actually are getting a lot of sunny days. Today in the 50's! I will be doing my favorite thing - taking a walk with my dogs through crunching leaves covered trails. We have to watch where we go though since it's hunting season. Get out there and enjoy it while it lasts! Ommm. It’s often the first and last sound in your ears in a yoga class. But what does it mean? Perhaps you’ve heard it defined as “the sound of the universe” — but what does that really mean? For starters, it’s all about sacred threes. Most faiths have trinities in their roots and Hinduism, where om was born, is no different. Even though it’s usually pronounced seamlessly so it rhymes with “home,” om is made up of three syllables: A, U, and M, or, phonetically, “aaah,” “oooh,” and “mmm.” Experts say these syllables can represent a slew of trios, including: the heavens, earth, and the underworld; the Hindu gods Brahma, Vishnu, and Shiva (aka creator god, sustainer god, and destroyer god); and the waking, dreaming, and dreamless states — “to represent all of consciousness,” says Yoganand. Some scholars say that the shape of the visual om symbol embodies each of its syllables — the three is the Sanskrit letter for “ahh,” that same three with the mini S on it is “oooh,” and the bindhi and half-moon at the top are the “mmm.” Some say the symbol is connected to Ganesh, the Hindu half-elephant god who removes obstacles, because if you squint, you can see his rotund curves and graceful trunk represented. For my art quilt OM symbol I used a plain background that goes well with my wall color and went with white as it gave a good contrast. Goddess tears free motion quilting ended up working really well. Had so much fun with this one I started another and will show you next week. With all the crap that's been going on the last few days - take some time to clear your mind - start over and let's just make the best of the path we have been given. Jill Buckley has inspired me many times from things she has been making and shares on her blog. This week she was recycling old sweaters into mittens. I found the video she used and it's really pretty easy. And they are lined with fleece! Something needed for the cold winter that is coming. You use the cuff from the sweater you are cutting up for the cuff of the mitten. I had this gorgeous felted wool sweater to small to wear in my closet for years just waiting for the right project. It didn't have sleeve cuffs so I improvised and used the top part of a sock. There is a link below the you tube video made by roman cake designs that takes you to her blog where there is a free downloadable pattern. The pattern is for a small to medium. I suggest before you use your nice sweaters to make one with something you don't care if you have to throw it out due to "the learning experience" my first one was way to small so I added a half inch all the way around the patterns and then made this pair out of denim. Making this denim pair I realize that you really need the softness and cushiness of a sweater. See what happens by the thumb part? This may have been my mistake in sewing but using a sweater you probablly wouldn't even notice. If you live in a cold climate you really should try this. I know you have a favorite sweater in your closet you can't or don't wear anymore.